Fancy clothes and gear are overrated! Most of my running career I ran without a Garmin. Though of course now that I have one I could never go back! My first race was a half marathon. I ran for years before I ran a race. I was in the middle of marathon training and someone said I should run a half so that the full wasn't my very first race! It was definitely a fun time and I knew I could finish it because I had run 13 miles before, just not in a race. 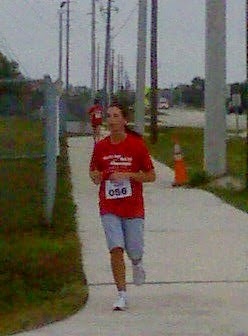 My first 5k wasn't until 2013! :) 5ks scare the crap out of me. NO room for error. I think back on my first half and can't imagine that being my first race ever...I think I would have quit racing! I wish I had access to my running history. It would be so fun to look back at it. My first race was also a 5k, it was Turkey Trot and I know I ran it nowhere near as fast as your first! I bet it was fun to run a themed race for your first 5k! I started blogging (on tumblr) when I was training for my first 5K so I can always go back and read those old posts which is really nice. It's funny to see what was important to me back then. Also, just like you, I was running faster back then. There were days when I was knocking out 12 minute miles flat which are a challenge for me now. I think my mentality just changed when I started wanting to run longer distances and I just stopped trying for 12 minute miles and ran with whatever was most comfortable. Those photos!!! Isn't it so crazy how the quality of cell phone photos has improved in such a short period of time?! I love this post! My first race was a ten km race and I peed a little in my shorts when I was sprinting to the finish, LOL. I totally remember my first race...it was the Navy 5k race. I had never run 5k before...I'd only been run/walking about 2.5k and decided to sign up for a goal. I remember going to buy a new pair of sneakers to wear (eeek....I did something new on race day), and the sales person was doing the same race. No one was there to watch me...I was doing it just for me. 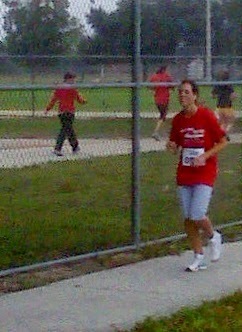 So I ran 4 minutes and walked 1 minute for the entire 5k...finishing in 32.40. Can you believe there wasn't a medal either? Eeeek!!! I don't think I saw a medal for a 5k until the end of 2013...it seems to be a new thing and I do kind of love it! It sounds like your first race was a good one! This post is great! My first 5k was sort of on a whim as well. I've tried to track down results but can't seem to find any... I can't imagine I did very well. I was also running in cut off sweats and a cotton t-shirt and I remember it being so hot and humid out. I'm not much of a gear junkie, but I do believe that wicking shirts help a lot. A friend of mine pointed out that my body has changed so much that these days I wear a tank top for pretty much any weather because I overheat too easily. I can't wear cotton tshirts to workout anymore! And I never wear the race shirt to the race anymore...I've developed a superstition about it haha.